These calculators will tell you how many plants you need to fill a given area. Plant calculation charts come in particularly handy when planting groundcover plants, annual bedding plants and other plants that you intend on planting over a large area spaced a certain distance apart. 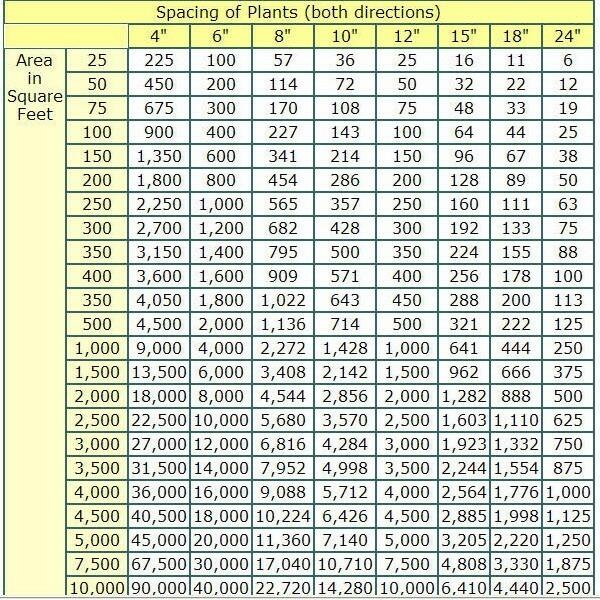 You can use either of the calculation charts below to determine how many plants it will take to fill a given area, based on how far the plants will be spaced apart. Before using the calculation charts you will need to measure and determine the total square footage of the area to be planted. Before you can calculate how many plants will be required to fill a given area you'll need to determine the total square feet of the planting bed. The chart below has fixed square footage in the left column (highlighted in beige) and spacing distances across the top (highlighted in yellow). Example: If you intend on spacing your plants 18-inches apart, and your planting area is 300 square feet, the box where that column and row intersect indicates you will need 133 plants to cover the planting area. If you don't find the exact size of your planting area, either estimate by selecting the closest area listed or use Chart 2 below to more precisely calculate how many plants will be required. 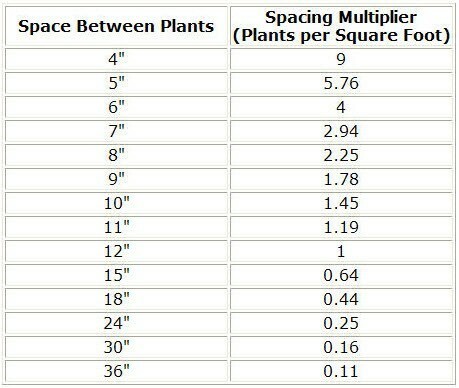 The column on the right is the number you need to multiply by the total square footage of the area you intend to plant. Very helpful. Is there a way to calculate for running plants like climbing roses? They don't need a large footprint but since they go up and out I'm not sure how to figure how many to put in a given space. When planted on a fence, trellis, partition, wall, or other structure, climbing roses can be trained to grow wider than they might typically grow naturally. If I were planting a variety of climbing roses along a wall or other structure that typically had a natural mature width of 6 feet I might space them anywhere from 6 to 10 feet along the structure...knowing I could train the branches to fill a larger space. I rarely would space then closer together than their natural mature width.